Famous Arborists You May Not Have Heard About | Mr. Tree, Inc. If you live in the Portland area, all you have to do is look out your window to admire one of the many trees that grace this lush metropolitan. But what do you really know about trees? Maybe you know that they derive their nutrients from the sun via photosynthesis and that they require various amounts of water to thrive, but have you ever thought about the notion that we need to advocate and care for our trees to ensure their survival? Judi Dench is a beloved English actress known for notable roles in Shakespearian plays and movies such as the James Bond flick Skyfall, J. Edgar, Philomena, and many others. She was also appointed an Officer of the Order of the British Empire in 1970. But beyond her illustrious career, Dench also has a passion for trees. She even goes so far to elaborate on her hobby with the BBC in the documentary, Judi Dench: My Passion for Trees. “Ever since I’ve been a little girl, I’ve adored trees,” she said. “I’ve even turned my six-acre garden into a secret woodland and I think of my trees as part of my extended family.” In fact, Dench has planted a tree in the memory of each friend of hers who has died. Follow along as she learns even more about the life of trees over the course of a year. “My life now is just trees, trees and champagne,” she said. Now, who could argue with that? John Chapman was a true arborist and someone you’re probably already familiar with as he’s better known by his folklore name, Johnny Appleseed. Born in 1774 during the American Revolution, Chapman learned the farming trade from his father once he returned home from war. Eventually, he set off from his home in Massachusetts and headed west with a bag of apple seeds. See, John didn’t believe in grafting, so would plant at least 50 apple seeds along the Midwestern frontier in order to lay claim to the land, eventually selling off swaths of property to new settlers. By not grafting his apple trees, John allowed nature to take its course, which provided us with versions we know today as delicious and golden delicious. But, Chapman’s apples weren’t for eating. Instead, they were used to make hard cider, which often replaced beer, tea, coffee, and even water, as it was safer to drink since the alcohol killed the bacteria. 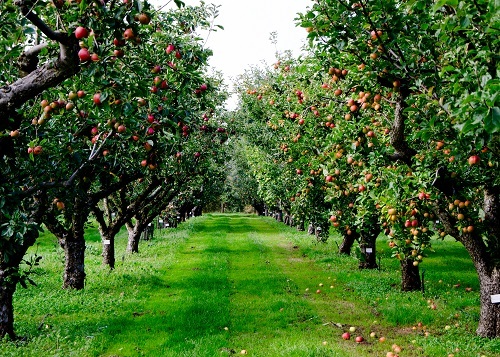 Unfortunately, with the introduction of prohibition, much of Chapman’s orchards were chopped down, aside from at least one – a 170-plus-year-old tree in Nova, Ohio. While Nowak is no newbie to the agriculture community, it might be the 2014 study he led on the health impact and environmental benefits that trees have in our lives that really launched his name into the spotlight. Nowak, a senior scientist with the U.S. Forest Service and professor at SUNY Syracuse, and his team found “the greater the tree cover, the greater the pollution removal.” Using 2010 data, they found that trees removed 17 million metric tons of pollution that year, lowering health care expenses by an estimated $6.8 billion. He is also a member of the International Society of Arboriculture and Society of American Forests and has been recognized numerous times for his dedication and research efforts. In addition to our involvement and membership in the International Society of Arboriculture, like Nowak, at Mr. Tree, we are also members of Friends of Trees. This is a non-profit organization founded in 1989 that brings people together to plant and care for trees in Western Oregon and Southwest Washington. To date, that has resulted in adding more than 750,000 trees to our regional area. Most notably, Friends of Trees participated in Threes for Trees where it planted one tree for every three-point shot scored by the Portland Trail Blazers during 2018-19 basketball season. This resulted in planting over 15,000 trees. Want to get involved.? Volunteer to plant trees with this local organization. The members already plan to add another 39 trees after just the Blazer’s home opener when they scored 13 threes. Our arborists may only be known locally, but we are a force in your communities. We advocate for the planting, care, and proper removal (when necessary) of trees. We know how to diagnose and treat trees that are afflicted with disease. We are experts at pruning and maintaining tree health throughout its lifecycle. We can even recommend the best trees to plant on your property based on the space, soil, and available sunlight. While there are people who dedicate their lives to trees—like we do at Mr. Tree—we don’t expect everyone to do so. That’s why we’re here to provide our expert advice, opinions, and services. Like those mentioned above, we love trees and are glad to live in the Portland and Vancouver regions where we are surrounded by lush greenery each day as we know it plays a positive impact in our lives. And, we want to spread this passion and positivity. If you have a question about arboriculture and the role arborists play or are simply looking for a qualified local tree company to care for your trees, reach out to our team today.